The asset sales proposal in the budget should reap $30bn-$35bn, but Nicholls will allocate only $25bn to reduce debt and the rest to recycle assets. This is risky because the Newman government does not yet have in place a proven best-practice method for identifying, prioritising and evaluating infrastructure projects, or a successful strategy to ensure that the projects that are built are able to be funded. This is particularly true in the transport sector, which is funded by taxes, tolls and fees, with no direct price signal on demand. 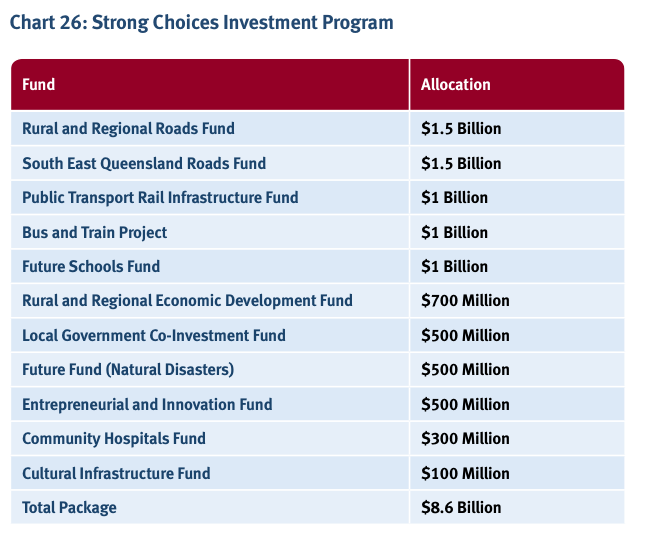 Unfortunately, the Government’s proposed Strong Choices Investment Program (see table I’ve copied and pasted below) allocates sales proceeds to particular infrastructure funds (Regional and Rural Roads, Future Schools, etc) without any comprehensive analysis, as far as I can tell, of what the most beneficial infrastructure projects are. I expect many officers in Queensland Treasury would hate this idea. Treasury officers typically hate earmarking funds because it reduces budgetary flexibility. It’s annoying for Treasury officers to see funds locked away for specific purposes that could be better spent on something more urgent and unavoidable. The Government may well need $8-9 billion to invest in new assets over the next six years, but it shouldn’t tie its hands by pre-committing the funds to particular purposes. This entry was posted in Budget, Queensland Government and tagged aaa, qld, qldbudget, queensland, strongchoices. Bookmark the permalink. The Newman government may not yet have in place a proven best-practice method for identifying, prioritising and evaluating infrastructure projects. But it does have a enormous election fighting fund – $8.6B in a Strong Choices Pork-barrelling fund to secure the seats of its many first term marginal electorates. Haha, that’s one way to look at it! I agree. If you are going to sell commercial assets (I’m not convinced we should), the proceeds should go to reducing the debt. I’m a little concerned about what is in the “Strong Choices Investment Program”. Without any robust analysis of potential projects under this fund, and given the record of the Governments (past and present) with such funds, Katrina’s concerns of a major “port barrelling” exercise are probably quite legitimate. With the exception of the health and education focus (if the right projects are undertaken), are any of the other areas of investment likely to deliver a net benefit for Queenslanders? Thanks Jim. Yes, there is a big risk of wasteful spending.